Friday April 25th 2014 will be the first anniversary of our Center getting under way. It was a very modest start (a facebook post), with the accommodations, programs, schedule, website and so on yet to appear. It was hard work, but the first part-time student arrived in June, first full-time student in early July, and first study tour group later that month. This website (while incomplete) finally went online in October, and is still being worked on daily. There is so much to do. It has been a busy and sometimes stressful 12 months, but one in which a new Japanese Language School has been created from scratch, and this summer and the year ahead should be a busy and exciting one. For one night though, it is time to relax. Enjoy some good food and company, and say a big thank you to everyone who has helped make it all possible. Without our amazing customers, host families, teachers and supporters, an ambitious dream would have died. The food is awesome, the nomihoudai likewise, and you can eat like a Raja and still have change from 2000 yen. If you can’t make it to the Fuji Picnic on Tuesday 29th, you can make a “one coin donation” (ie anything from 1 to 500 yen) to our on-going Fukushima donations. No donation is too small! 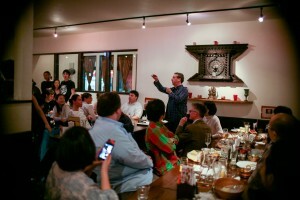 Location: We will be celebrating at Shubhakamana in Okazaki, at their wonderful Minami-ten.